How do the inhabitants of a city know when they have seen art? How do they know when they’ve lost it, forgotten it, or when it’s been returned? For all of its existence, Hong Kong has been regarded as a city hostile to high culture, and yet, since its founding as a port city in the mid-nineteenth century, its artists have been making art. Their work has not always been noticed; often it has been ignored. Even as the cultural and market value of art has grown greater and greater, art in Hong Kong has, counter-intuitively, been getting smaller and smaller, sometimes to the point of invisibility. Hong Kong’s contemporary art thus presents us with a unique dilemma: it manifests as a set of practices and sensibilities that evade celebration and sensationalism, and yet, more than anything, it yearns for recognition as a distinct cultural form. How can we recognise that which avoids being seen? In the context of the Pearl River Delta (PRD) region, the seeming absence of art in Hong Kong is all the more noticeable when contrasted with its cultural cousin Guangzhou, a city with a vaunted history of defiant creativity. And indeed, even within a shared regional milieu of a self-deprecating and casual vibe, the difference between Guangzhou’s and Hong Kong’s artistic cultures is dramatic. The Guangzhou artist Lin Yilin (born 1964) experienced this first-hand in the mid-1990s when he tried to perform the same action in the public spaces of the two cities. The first action took place in Guangzhou in 1995, when the city was just embarking on the massive urban transformation we know so well today. In the shadows of a tall building under construction, and over the course of several hours, Lin simply moved a wall of cinder blocks, carrying one block at a time, from one end of the wall to the other, across several lanes of oncoming traffic. A strenuous and extended act of urban intervention, Safely Maneuvering Across Lin He Road embodied the physicality of urban construction and the relentless routine of urban flow. Trudging at cross purposes to the oncoming traffic like a makeshift, human, and transparent Tilted Arc—the infamous public art sculpture by Richard Serra (American, born 1938) that, in 1981, bluntly divided New York’s Federal Plaza and made it impossible to traverse—Lin’s work demanded a momentary but unavoidable pause in fast urbanisation and hurried everyday life. Months later, in early 1996, Lin had the opportunity to reperform the work in Hong Kong. This performance was entitled Drive Shaft. Lin had first hoped to move his bricks through the Hong Kong subway system, onto and off a train, from station to station. Probably knowing how unlikely it would be for the Mass Transit Railway (MTR) to permit such a disruptive action, Lin recalls that the idea was rejected by his hosts at the Hong Kong Arts Centre before permission was ever sought. As an unhappy compromise, he then proceeded to conduct the work in the pedestrian flyover near the Arts Centre in Wan Chai over the course of four days. Intending to comment on the imminent transition to mainland Chinese rule, this time Lin had handwritten on the bricks the names of various Hong Kong governmental departments. 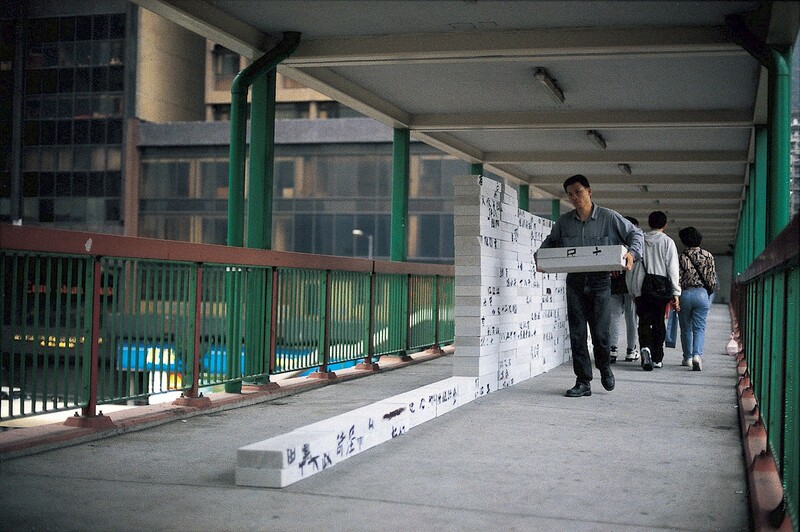 On the first day, some Hong Kong artists volunteered to join in the performance, since the wall was larger and the process therefore more demanding than the Guangzhou version. The next morning, however, Lin arrived on-site to discover that his wall of bricks had been completely altered and moved, blocking the passageway of the flyover. He assumed it was a prank or critique of some sort by those artists helping him, and returned the brick wall to its original position in order to start the performance all over. Just as he was doing that, though, a passer-by pulled out his phone and called the governmental Highways Department, which dispatched officers to clear Lin and his wall of bricks. Lin was then forced to move his bricks off the flyover and down to the street-level doors of the Arts Centre in order to continue the performance. But again there was a problem. This happened to be the period of time when many Hongkongers were queuing at the nearby Wan Chai Immigration Tower in a rush for the British quasi-passports offered to some residents. So on the last day of performance, Lin’s wall of bricks, with bricks displaying the names of Hong Kong governmental departments mixed up among them, obstructed the queue and frustrated an already anxious citizenry. The next day, Lin’s wall of bricks was finally cleared away by the Highways Department, and the performance ended as a failure. For an artist like Lin based in a city with subtle but powerful artistic interventions despite many restrictions, the event and its multiple missteps were only further evidence that art was impossible in supposedly free Hong Kong, where his action was rejected by authorities, citizens, and fellow artists alike. Lin Yilin, Drive Shaft, 1996, photo documentation of performance. Courtesy the artist. Lin’s ‘brick-moving’ practice fits squarely within the contemporary tradition of performance art, one that heroises lengthy duration, stalwart physicality, and provocative public engagement. That his action would be quite recognisable as such in post-Mao China as it would be in London or New York City, and yet not at all in Hong Kong, demonstrates how distinct the Hong Kong aesthetic space is from those of its immediate region, the PRD, or those cultural centres in which it seeks recognition. But concomitant with that recognition is a specific set of expectations found either in the legacy of modern socialist art, which demands largeness and grandeur, or in avant-garde critiques of capitalism, which demand transgression and provocation. Beneath neither of these ideological traditions has Hong Kong culture ever fit comfortably. Instead, for many decades, contemporary art in Hong Kong has been sidestepping these expectations with a decidedly different attitude: that of smallness in form, size, scale, and expression. This trend towards smallness in Hong Kong art is a phenomenon that is partially due to practical limitations determined by the minuscule spaces in which Hong Kong inhabitants live and work, and the relative lack of space, market, and support for art production and display itself. But it is also a formal trend that has developed into a broader aesthetic discourse, one we might associate with an aesthetics of ‘disappearance,’ to borrow the term used by cultural studies scholar Ackbar Abbas, or with the more global, post-1968 micropolitics described by the French philosopher Gilles Deleuze. It may well be that the smallness of Hong Kong art is a sign of a broader refusal of the reductive geopolitics under which Hong Kong inhabitants and artists—like many around the world—operate; or it may well be a product of an emerging global aesthetics of the mediated, ephemeral, personal, and affective, in which some theorists see new forms of political energy. But while there are both global and local affinities with which to explain smallness in Hong Kong art, there are regional ones too. As a sensibility, it is also an inflexion of the much broader Cantonese sensibility that plays in myriad ways with understatement and self-deprecation, whether as the basis of wit in Cantonese popular language or as evident in the doubting drawl that ends the questions of everyday conversation. The most virtuosic and long-standing example of it in Hong Kong’s popular culture is the humour of Stephen Chow, whose Everyman characters model false self-aggrandising and undeserved narcissism in the most exaggerated ways. It is a sensibility of the everyday, the lowly, and the underhanded; of celebrating every good deal, regardless of how little the advantage; of cute-ifying every small gesture no matter how useless; and of the well-placed slangy remark defusing the most serious of subjects. This is not the cultural politics of the weak, but of those who refuse to grant formal power anything more than a veneer of absurdity. At its best, in other words, smallness performs the most incisive of critiques without doing much at all. That nonchalance of everyday Cantonese life infuses much of Hong Kong’s contemporary art, particularly that of a new generation of young artists, among whom I include Lam Tung-pang, Lee Kit, Pak Sheung Chuen, Silas Fong, and Mak Ying Tung. These artists belong to a generation born during the inauguration of the Reform Era in China (1978), and whose childhoods were spent under the final throes of British colonialism (ending in 1997). Those were the years of that surreal countdown during which a late capitalist territory prepared itself to submit to communist party rule. As artists, though, they were formed under a mainland-led Special Administrative Region government, which coincided with the emergence of Chinese contemporary art as one of the most influential forces in the global art world. Educated in the unflashy fine arts departments of Hong Kong’s university system, these artists nevertheless established their careers in the dramatically internationalised art world of the 2000s, in which Beijing had emerged overnight as a cultural centre. These have been years of historic inversions and deep contradictions. 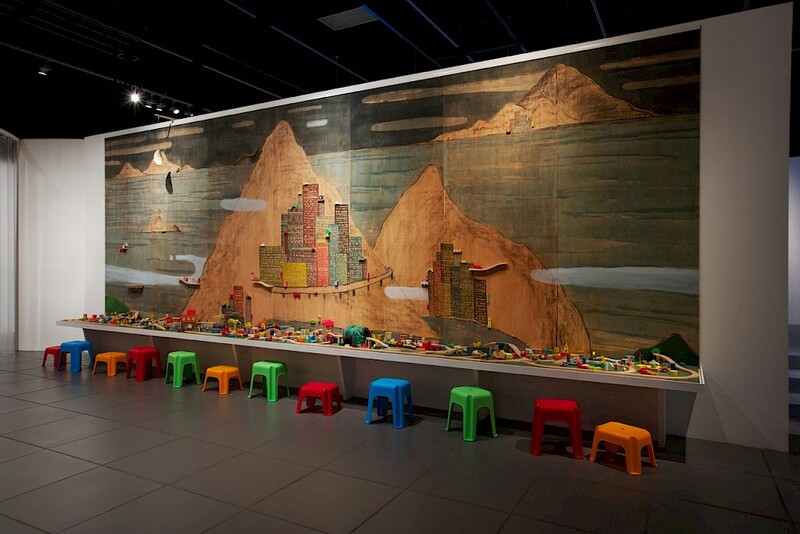 Lam Tung-pang, Things Happened on the Island, 2013, acrylics, charcoal, pencil, scale model, and wooden toys on plywood, 300 x 700 cm. Courtesy of the artist. If smallness is understood in the formal terms of size, we can observe its gradual emergence in the work of the painter Lam Tung-pang (Hong Kong, born 1978), whose art in the past ten years has pulled the viewer from the large to the minuscule. Lam paints in a variety of mixed media on plywood, and his imagery draws recognisably from both Chinese landscape painting and Hong Kong graphic design (cutesy, line based, flat, and often anthropomorphic). Even though much of his work is done on large supports, the tone is calm, the palette soothing, and the human or anthropomorphic dimension presented with a soft touch. In 2008, during a residency in Beijing, he drew in charcoal, and then partially erased, a mountain range on multiple panels of plywood, titling it Faith Moves Mountain. It is a sparse and nearly abstract work reminiscent of ink-blackened and cut woodblocks. While a large work, its surface is impressionistic and fleeting. In 2011, Lam developed that large landscape motif into a series of smaller mixed media mountainscapes dotted with skyscraper clusters roughed in pastel colours and painted on plywood panels again. This time, tiny plastic models of lonely figures and domestic objects are affixed in relief, sometimes inside small boxes, to the paintings, mixing the antique look of ink landscape with very contemporary and very unextraordinary vignettes. In those years, Lam also experimented with arranging vignettes inside his studio desk drawers, making assemblies in those small and hidden spaces as if they were preparatory sketches for his paintings. By 2013, in a multimedia work entitled Things Happened on the Island, this use of relief elements on two-dimensional work had grown into a full-blown readymade diorama of children’s toys affixed like a ledge to another very large landscape painting. The painted portion of the work, of mountainous islands manned by lonely groups of tall buildings, contrasts with the miniaturised toy cars and model roads that children are invited to play with before it. While the earlier work done in Beijing recognisably draws upon a mountain-sized reflection on mark-making and erasure, in his more recent work Lam has minimised that fairly common artistic theme with the literal foregrounding (and indeed projection) of boyish miniatures of the city. The variability of the sizes of found objects throughout Lam’s work speaks to a formal search for a scale appropriate to relate against the picturescape of mountainous landscape paintings. Lam once shared a Fo Tan studio with a fellow Chinese University of Hong Kong art department graduate, who would sleep late into the day in the bunk bed in the back. Slumped in their studio would often be a giant stack of what looked like nonchalantly folded bed sheets. Of course, that studio mate was the artist Lee Kit (Hong Kong, born 1978), and the ‘bed sheets’ were actually the products of his practice of painting rectangular fabric pieces end to end with mundane stripes and patterns so that they would appear at first glance to be faded household textiles. Lee had developed the practice during his master’s studies at CUHK. Notably, the patterns that Lee painted on the cloth were not referential—not replicas of specific commercial designs, nor iconic Hong Kong, nor British, nor Chinese products—so the patterns were neither nostalgic, nor historical, nor even familiar. Just faintly unremarkable. Soon after, Lee would develop this painting method into a full-blown art-life practice: when invited for exhibitions and residencies, he lived temporarily in the gallery while painting all the domestic textiles (bed sheets, pillowcases, dishrags) he would use in the course of inhabiting the space. In other words, what began as mimicry, via the painting of domestic fabric patterns, ended up dissolving into the everyday function of those textiles after all. It is a kind of performance art that is essentially invisible, turned inwards in the form-function dyad. Lee Kit, Hand-painted cloth used in pantry, 2009, acrylic on fabric. Courtesy of the artist. Lam and Lee are hence two Hong Kong painters who have been pulled, literally, figuratively, and functionally, from traditional Western fine arts media into the genres and objects of the everyday. Yet their references are elusive and incidentally chosen—neither appropriated with purposiveness nor so radically withdrawn as to broadcast refusal. Rather, there is a certain sense of haphazardness in their use of ordinary signifiers, suggesting either a lack of will or interest to engage in, or even a tendency to avoid, the cultural politics of appropriation. That incidental inattention is moreover part and parcel of the formal appeal of their finished works, whose charm depends on the minute and imprecise wavering of the line, or the gradual fading away of dense colour into plywood surface. This mirrors the appeal of the individualised and customised craft aesthetics that are symptoms of contemporary painting’s deskilled condition. In that sense, they belong to the global rise of post-industrial craft aesthetics—a material culture celebrating the microproduction of urban recluses whose cities have stopped hosting intensive manufacturing and have found new ways to value ‘making’. The emergence of the artist as just one among many citizens engaged in intensely private (if sometimes creative) actions is another strand of conceptual art that would take on extra potential in the intensive urbanscape of Hong Kong, especially in the work of Pak Sheung Chuen (Fujian, born 1977). Pak’s work is squarely performative and conceptual; nearly all of it consists of private actions in urban settings that the audience accesses only through the artist’s statements or documentation. Pak developed this particular practice by way of a highly unconventional gig: two years of producing a weekly double spread in the popular Hong Kong newspaper Ming Pao. Pak was invited by then-editor Helen Lai, who gave him free rein to reflect upon current events in Hong Kong on a regular basis. Many of the themes he was assigned were obviously political, but Pak chose to diffuse the oppositional nature of the politics with ‘alternative perspectives’ by literally altering the perspective: for example, photographing a protest from an unexpected angle to include daily life passing by. Pak’s work for Ming Pao is unprecedented in the history of contemporary art for its regularised and extended use of the newspaper column as form, structure, and display. For two full years, Pak was paid as a weekly columnist and assigned ‘stories’ as any columnist might be. He then had to supply a topical work, in the form of laid-out and accessible texts and images, in a matter of days. As with any columnist’s work, the newspaper would receive letters from readers in response to Pak’s spread, and his practice became imbricated in a weekly dialogue between his self-reporting documentation and the newspaper-reading public’s reaction. Pak’s work was hence neither a parodic artist-produced ‘newspaper’ that mocked the structures of mass media (such as those produced by the Situationists and the Surrealists) nor a temporary ad paid for by an artist to make a public artist’s statement in the conceptualist mode. Instead, Pak and his editor created an alternate venue for the display of art without any anxiety over being co-opted by existing power structures. Rather, Pak proudly described his practice as putting him in a position not unlike that of any other person in Hong Kong without an office job: unable to stay in a small home all day, wandering the city, and seeking a safely mediated dialogue with his fellow citizens. Eventually, paying attention to aspects of public space ultimately led him to ruminate on the meaning of citizenship and normalised life in the city. Pak then proceeded to make extremely minute, subtle, and temporary interventions in that space, or at least to take as his material the small interstices between public space and private thought where something might be done. Pak Sheung Chuen, Waiting for a Friend, 2006, performance, Kowloon Tong MTR Station, Hong Kong. Courtesy of the artist. It is a beautiful exchange, not only for its brevity but also for its tiny insertion of just slightly counter-normative behaviour into a scene of Hong Kong’s permanent rush hour. Of course, that insertion itself is only a momentary disruption of the urban flow and the temporal horizons of waiting, expectation, and chance. One imagines the two friends, with only a couple of remarks exchanged, returning to the sea of motion of the city’s subway. 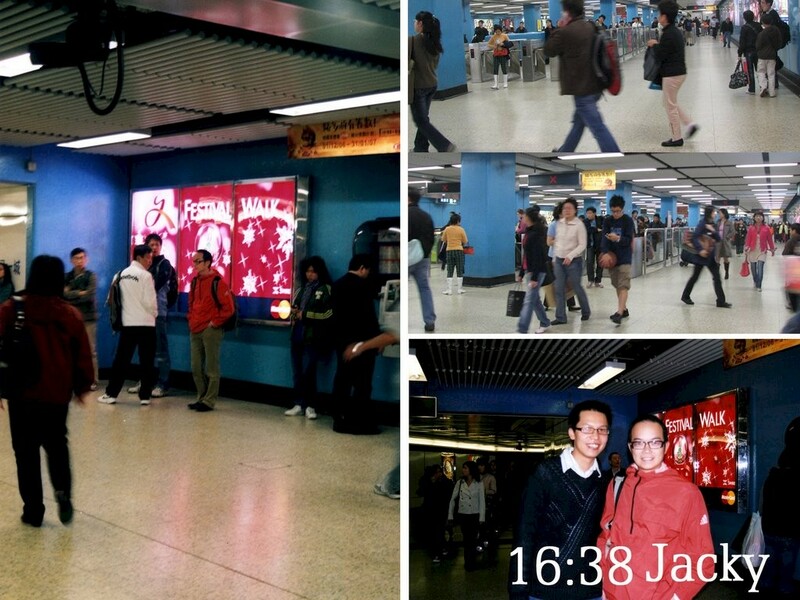 It is an action feasible as ‘art’ perhaps only in a place like hyper-rationalised Hong Kong, where most residents would likely be able to wait for a friend without an appointment at any of its main subway interchanges. In other cities, a person might have to stand far longer for such an event to take place, while in yet others, meeting a friend without an appointment would not be remarkable at all. There is always a sort of existential weight to ‘waiting’ in a modernist context, but unlike the Kafka character who waits all his life only to face the same immovable bureaucracy, or the Hongkongers waiting for their passports while Lin continually recreated his wall of bricks, Pak’s action unwinds the significance of waiting through the very short period he actually had to do it, and through the charm and pleasure of seeing, at the end of it, a friend. In the efficient flow of a Hong Kong day, even a few seconds of delay are pregnant with meaning, at least as depicted by Silas Fong’s Stolen Times for Sale (2008). Fong (Hong Kong, born 1985) is also a graduate of CUHK’s MFA programme, and his Stolen Time for Sale is a video work that documents the brief seconds he ‘steals’ from strangers in a high-rise residential tower when he presses the lift button for no reason except to record their reactions when the doors open. The effect of this microdisruption is sometimes captured in the passengers’ expressions: mostly they are unperturbed, annoyed, bored, or puzzled, and every now and then someone directly confronts the camera with an aggressive stance. Each is a wonderful moment of reveal, when the mirrored doors part and we get a glimpse of who is in the lift and what their reaction is. Fong then ‘sells’ cuts of the documentary to gallery goers, re-editing the video in its next run and replacing the sold footage with blank spaces and a caption noting the sale price. The briefest of visibilities in the tiniest of spaces is thus ultimately rendered invisible again, and presumably at the conclusion of all ‘sales’, the work will be only an erased sequence of black screens with prices exchanged for seconds. Silas Fong, catalogue for Stolen Times for Sale, 2008. Courtesy of the artist. 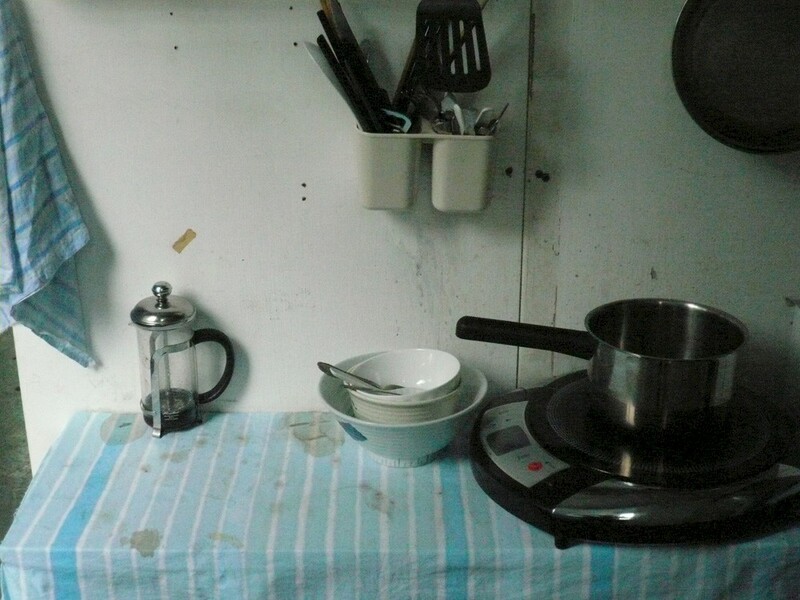 Taking up a little time and doing something that looks like work—and yet is not a job—all in order to question ordinary use values is powerfully enacted in Mak Ying Tung’s (Hong Kong, born 1989) Sterilization (2013). In this work, the artist ‘sterilises’ strawberries by removing their achenes (‘seeds’) with a toothpick. The practice is related to her Disarming (2013), in which she removes the prickles from a tiny cactus with a pair of tweezers. Sterilization has been executed, performed, and installed with variations several times, and it is documented in different videos. In the video versions, only two hands are shown, determinedly at work with a toothpick on a single strawberry over a clear Petri dish. The action seems at first clinical and also cosmetic, the bright red of the strawberry head impossible not to anthropomorphise—since strawberries are often related in Hong Kong skincare commercials to noses with blackheads that need to be extracted, and in Taiwan to the millennial generation. The hands pick at, dig, rub, and poke each tiny seed of the strawberry. By the end the fingers are dripping with red liquid and the cute strawberry is reduced to a horribly unrecognisable pulp. The titular action, of course, makes clear the extent to which beauty and cleanliness are embedded in the procedures of biological and social reproduction. The coercive processes of reproductive control are dramatised in the gathering terror of tiny, individual, one-after-the-other pinpricks. A video of two hands sticking out of holes in the wall picking the seeds of a strawberry with a toothpick. 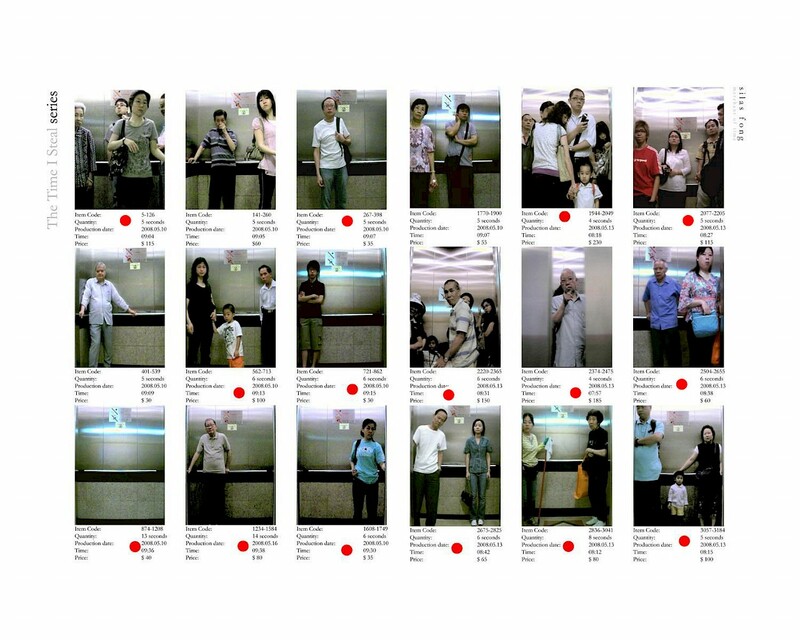 Mak Ying Tung, Sterilization, 2013, video. Although so much of the history of performance art mythicises duration and obsessive repetition, and although all of the above works by Hong Kong artists utilise duration and repetition in some respect, upon closer inspection, few of these works, in fact, take very long, or have really grown into an extended long-term practice. Pak Sheung Chuen waiting ‘for a long time’ was but fewer than four hours. Silas Fong’s disruption of his neighbours’ lift time was measured in seconds. Mak Ying Tung and Lee Kit both repeat their actions, yet neither requires an arduous physicality nor demands of the viewer any relational (let alone difficult) experience. While Lam Tung-pang works at a larger scale and sometimes invites participation, that invitation is made, literally, with toys. Overall, none of these works takes actual risks with property, legal codes, or power structures, and indeed, works like Fong’s stolen seconds and Pak’s newspaper spreads for Ming Pao mesh seamlessly with the expectations of commercial art and mass media systems. While often taking place in the public space or the everyday, they never obstruct it. Finally, though self-consciously operating as such, these Hong Kong artists often don’t announce themselves as interveners in the city, the home, or the art world. It is in these senses that their sensibilities are so remarkably different from the legacies of conceptual and performance art, the grand politics of modernist or socialist art, and even the contemporary performance art of Guangzhou. And yet, it would be too easy to dismiss these departures as symptoms of a new generation’s capitulation to depoliticised or commercialised microaesthetics. For these young artists work in a time and place when transgression and grandeur have already been usurped by large, geopolitical, and even universalist conceptions of power struggle. Under such conditions, the small, the invisible, and the brief invoke an aesthetics of microartistic production while rendering the problematics of power separately from those of visibility. They instead propose a means of reflecting and contemplating scale with neither contest nor critique. Here the process of denaturing, becoming, deferral, and delay takes place as a search for the appropriate scale—and space—of an unintrusive voice. Image at top: Lin Yilin, Drive Shaft, 1996, photo documentation of performance, M+, Hong Kong. Gift of Guan Yi, 2013. Winnie Wong, Associate Professor of Rhetoric and History of Art at the University of California, Berkeley, is a historian of modern and contemporary art and visual culture, with a special interest in fakes, forgeries, frauds, copies, counterfeits, and other challenges to authorship and originality. Her research is based in the southern Chinese cities of Hong Kong, Guangzhou and Shenzhen. Her writing engages with Chinese and Western aesthetics, anthropology, intellectual property law, and popular culture. Her book, Van Gogh on Demand: China and the Readymade (University of Chicago Press 2014), was awarded the Joseph Levenson Book Prize in 2015.